How long do I need to save before I can retire? 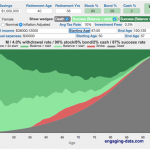 This early retirement calculator / visualizer is designed to project the number of years until you can retire, based upon a few key inputs such as annual income and spending, income growth rate, expected annual spending in retirement and asset allocation. It is a pre-retirement calculator that is useful before you retire to get a sense of how many years it is likely to take to accumulate enough money to retire. The three primary modes that are available in the early retirement calculator are: (1) constant, single fixed-percentage real return rates, (2) historical series of real returns are applied to account for likely variability in future returns and (3) monte carlo simulation of the variable returns based upon user-specified input parameters. 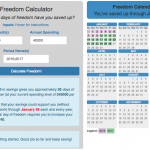 This interactive calculator was built to let you play with the inputs and help you understand how savings rate and retirement spending strongly determine how long it will take you to save up for retirement. Note: it does not simulate the post-retirement period when you start to draw down your savings. That can be done on this post-retirement calculator (Rich, Broke or Dead) which compares the frequency of various outcomes in retirement (running out of money, ending up with way too much money, and life-expectancy). – Use this button to generate a URL that you can share a specific set of inputs and graphs. Just copy the URL in the address bar at the top of your browser (after pressing the button). One of the most important things to note in using this calculator is that all growth rates (e.g. market returns and income growth rate) and values shown are done on a real basis, i.e. everything is done in current dollars. Your Target Retirement Amount is based upon your expected annual retirement spending and your withdrawal rate. Your money (including the money you’ve already saved and the amount you save each year) is invested based upon your asset allocation and will grow based upon the following formula annually. The growth rate will vary based upon how much of your savings is invested in stocks vs bonds vs cash and the annual growth rate for each of these assets. Your savings rate plays a large role in accumulating enough to retire and improving your savings rate can be done by reducing your annual spending and/or increasing your annual income. The early retirement calculator determines how many years it takes to reach the FIRE Target. Fixed percentage: This mode requires you to enter the expected value for future real stock and bond returns (the default is the US historical average values from 1871 to 2015 of 8.1% and 2.4%). You can see how your retirement time depends on these rates of return. Historical cycles: This mode uses real stock and bond returns data from the last ~145 years and applies them sequentially to your savings annually to project their growth over time. Each of these chronological series of years starting in a different year is one historical cycle. Each cycle has a different series of stock/bond returns and thus has a different amount of money each year (even with the same annual savings profile). 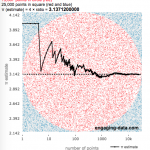 Monte Carlo simulation: This mode simulates thousands of possible sets of paths to meet your target and calculates the probability of different trajectories for your retirement investments. You can use the historical distribution of returns for your draws (8.1% real return for stocks and 2.4% for bonds) or you can specify a different average return for each set of assets. This enables you to run for optimistic or pessimistic scenarios. 10th to 90th percentile – if you have a number of results or observations that you have put in order from smallest to largest, the 10th percentile is the result that is higher than 10% of the other results, while the 90th percentile is higher than 90% of the results. The range from 10th to 90th percentile encompasses 80% of the results and ignores the extreme outliers in the data. 25th to 75th percentile – similarly, ordering results or observations from smallest to largest, the 25th percentile is the result that is higher than 25% of the other results, while the 75th percentile is higher than 75% of the results. This range encompasses the middle 50% of the results and ignores the lowest and highest results. Median – the median is the data point that is in the middle of the ordered data; exactly half of the results are below and half are above. Current Spending Sensitivity – Sensitivity of retirement time to current spending. 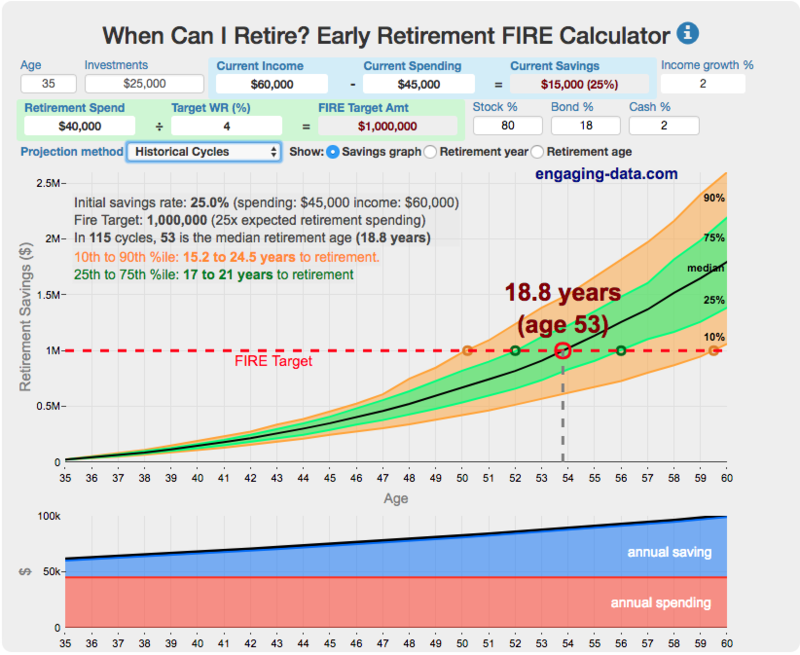 **Note, this sensitivity focuses on spending while saving up for retirement, not spending after retirement** The calculator runs different spending cases between -20% and +20% spending to show you how your time to retirement changes with these spending amounts. Stock Returns Sensitivity – Sensitivity of retirement time to stock market returns, which varies the user input stock market returns for the fixed and monte carlo cases between -60% and +60% returns. When using the Historical cycles or Monte Carlo projection, you can view a histogram showing the distribution and variation in the number of years until retirement. Each of these individual runs has it’s own value for when your total invested savings surpasses the FIRE target. One of the key takeaways is that early on in your journey towards retirement, savings plays a larger role than investment returns. This highlights the importance of having a high savings rate if you would like to minimize the amount of time it takes to achieve your FIRE target. I hope that is tool will be useful for anyone trying to achieve financial independence. As always, any comments, suggestions or feedback will be greatly appreciated. Calculator Update – I added a button to generate a URL for a specific scenario that you can share with others. Privacy and Data statement: None of the information entered into the calculator is transmitted to our server or anywhere else. All of the data stays on your computer and all of the calculations are made within your browser (rather than on this site’s server). Very well done, thank you! Great calculator, thanks for putting the effort into this! How would rental income be used in this situation? Would the equity in the rentals be included in your investment amount? Thanks! You could include it into your net rental income (minus expenses) or you could subtract it from your expenses. Either way will work. If you believe it will grow faster than inflation you probably should put it in income so you can apply the income growth rate. You shouldn’t put the equity into your savings as you won’t be earning a return on that that you can live on. Wonderful job with the calculator. I appreciate the work you put into it. Very quick and easy to use when I want to see a “what if” type scenario. Just bookmarked. Thanks again! Thanks for the mobile friendly update – works great! Does the retirement spending factor in future inflation? For example $25,000 in 15 years has the same buying power as $16,000 or so today. If I need $25,000 in today’s dollars to retire I actually need to receive $38,000 or so in 15 years. Yes spending is inflated into the future so that your purchasing power is more or less preserved.